Product Description: Solaray Guaranteed Potency Herbs deliver confidence by providing exacting and consistent dosing of thoroughly tested herbs of the highest quality available. Turmeric is a popular spice used in curry dishes throughout Asia. 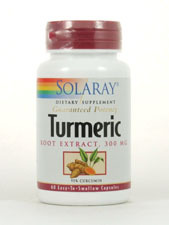 The turmeric in this product is a highly purified extract guaranteed to be 95% curcumin. Warnings: Keep out of reach of children. Keep your licensed health care practitioner informed when using this product. Do not use if you are pregnant, have stomach ulcers or hyperacidity. Additional Info: Store in a cool, dry place. Do not use if safety seal is broken or missing. Does Not Contain: Solaray guarantees that no ingredients other than those listed on this label have been added to this product. Suggested Use: Use only as directed. Take one capsule two or three times daily with a meal or glass of water.